It was bound to happen, but now it’s official. Apple shares opened at $96, down 8 percent compared to yesterday’s closing price of $104.35. But because this downswing is about Apple, 8 percent represents a lot of money. In just one night, Apple investors shaved around $43 billion off the company’s market capitalization. Big drops like this don’t happen often for Apple given the size of the company. In 2013, for example, Apple was down 10 percent. At the time, the company suffered from a lot of uncertainty and volatility. This time, investors are afraid we’ve hit peak iPhone. This quarter was Apple’s first year-over-year sales dip when it comes to iPhone sales. It’s unclear what’s next for Apple. iOS is one of the two dominant platforms and Apple is comfortably selling tens of millions of iPhones every quarter. It’s a huge money-making business. But investors only want to hear about growth, growth and growth. So let’s put this into perspective. Apple is still worth around $539 billion. 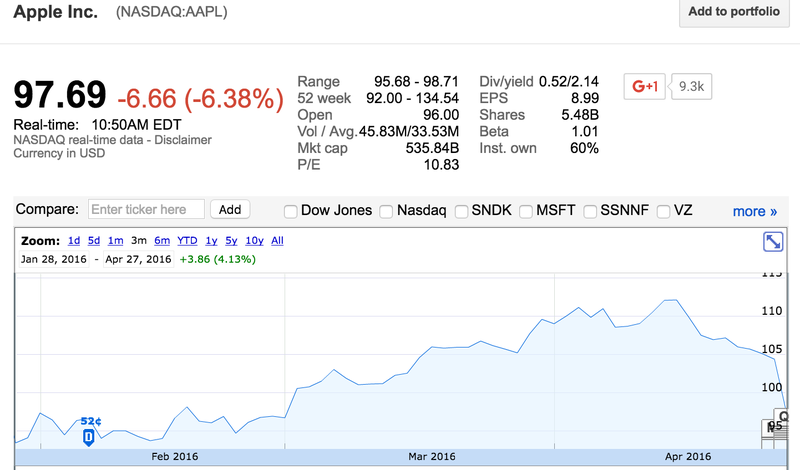 Even more relevant, Apple shares were trading at $94.69 (below today’s price) on… February 23. Apple is doomed! They’ve hit a 64-day low!